This project took place in Arba Minch Prison, in Southern Ethiopia. What is explored and reflected upon in this essay is the way in which the project unfolded, and what questions arise for knowledge generation. Sharing the value of intercultural exchange through the act of making art, as well as the impact of different approaches to teaching and education, in informal in-the-field settings, are activities that generate value; however, the nature of that value remains hard to analyse. Ethiopia is seen as having the potential to be a key site in Africa for the rest of the world: the African Union is based there, along with the International Monetary Fund (IMF) and a substantial diplomatic presence. A high-speed railway was recently built to allow the trading bottleneck of Djibouti to be bypassed, so that goods may more easily enter Africa. The hope that Ethiopia represents is the latest in an attempt to decide the best way for the West to work with Africa in trading, market and diplomatic terms. This concerns food and technological capacity building in Africa, which the West regards as monolith, just as much as African nations view the West as a block. Ethiopia is also one of the oldest Christian countries in Africa, and apart from the brief five-year Italian invasion during World War II, Ethiopia has never been colonised. It has a complex recent history, however, with the Communist Derg and royal dynasties that have ruled since the Abyssinian era. 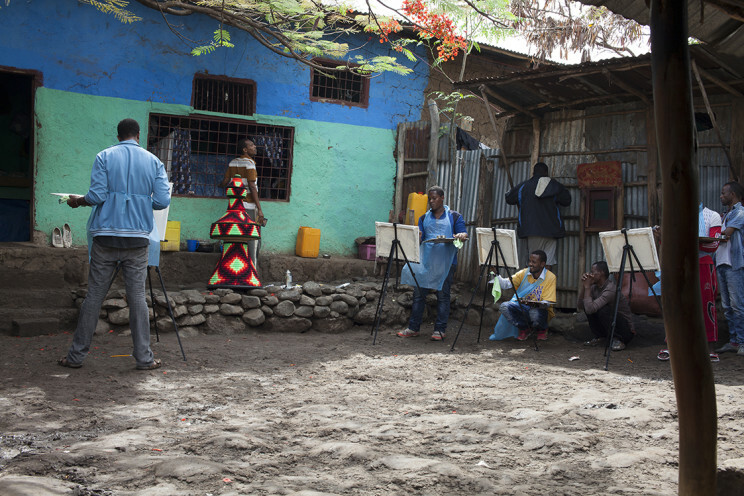 In 2014, the Department of Foreign Affairs in Ireland, through the Ambassador in Ethiopia, Aidan O’Hara, expressed an interest in developing an artist residency, specifically for a painter, in the Irish Embassy in Addis Ababa. This interest is part of the effort to demonstrably embed an acquaintance with the culture of Ethiopia into how Ireland approaches the country. Reciprocally, Irish people would be introduced to Ethiopia, symbolically, through an Irish artist. This project was developed by Ambassador O’Hara and myself, then Director of Limerick City Gallery of Art and formerly Director at the Centre Culturel Irlandais, Paris, which was the platform for creating this link between Ireland’s contemporary art world and its diplomatic missions. One of the more specific outputs was that the Irish Embassy would display a painting in the Irish Ambassador’s residence by the resident Irish artist. This is where many visits and discussions aimed at furthering the relations between Ireland and Ethiopia take place. The work on the walls would be a powerful statement of connection in diplomatic and cultural terms. Ambassador O’Hara has a strong understanding of how contemporary art functions in cultural diplomacy terms and agreed that a rigorous selection procedure was necessary. Thus, myself and Mark O’Kelly of Limerick School of Art and Design (LSAD) set about selecting an artist. We established the parameters of the residency as a field trip or information-gathering exercise rather than a supported visual arts residency. The parameters also included an established painting practice and a clear interest in other cultures. A shortlist was compiled and Ramon Kassam was selected as the first artist. Building on this first successful trip, Rory Prout, another Limerick painter, was invited to travel to Ethiopia in 2015. One of the field trips he undertook as part of this residency was to Arba Minch Prison in southern Ethiopia, at the invitation of Paddy Moran, a Spiritan Father (formerly Holy Ghost Order). Rory was based in a substantial compound/ mission dedicated to the progression of education opportunities and infrastructure throughout Ethiopia, which comprises a series of small bungalows, in the city of Arba Minch. This mission also accommodates agriculture and food projects from universities and development programmes. Rory was invited to host an art workshop inside the prison in one of the classrooms built by the Spiritans. The response to the art project by the prisoners and the prison authorities was very positive, with strong engagement by the male prisoners. Rory Prout, an LSAD graduate, used these sessions to begin a series of formal, rules-based training sessions in the management of paint, canvas, tools and rudimentary approaches that set the tone of the workshops. A second series of workshops then took place in which Rory was joined by painter John Galvin, curator and artist Noelle Collins, photographer and painter Isabella Walsh, painter David O’Kane (who was also awarded the residency in 2015) and Limerick-based ceramicist Mary Conroy. Isabella Walsh filmed and took photographs as often as was possible. I joined this group as a curator during the third and final workshop series, to imagine and think through what the workshop represented and might develop into in exhibition terms. layer of complexity into relationships with Africa generally and Ethiopia specifically. Another element of this art project was volunteerism. No fees were paid to the tutors, but expenses were covered. This was an important factor in the exchange. No contract of labour existed but there was an implied teacher/student and master/apprentice relationship, introducing a hierarchy that was primarily about knowledge, but was troubled by the issues surrounding voluntary activity and incarceration, as well as the wider educational context. Further complexity lay in the relationship between prisoner and service provider. In the Arba Minch prison, the deprivation of liberty – rather than a punishment system – characterises the prison ethos. Guarding and control is tacitly conceded but there are armed guards and punishments for infractions. What these possible infractions might be is not disclosed. In the first workshops, Rory set the structure: morning and afternoon sessions which followed lesson plans. This worked alongside the prison schedule for meals and the type of curfew attached to end-of-day routines regarding visitors and workers. The participating prisoners were drawn from the main group of male prisoners. Their offences, sentences and personal details were confidential. Candidates were invited or selected by the prison authorities and prisoner representatives, sometimes according to their performances within the prison. Because of this, and because some key participants would go on to the more advanced class, or to occupy positions of responsibility such as librarian or prisoner president, the place of the art workshop was considered prestigious – something close to an award. The prison authorities agreed to enable the art workshop as a result of the advocacy of the Spiritan Fathers and the role of the Irish authorities in vouching for the project personnel, but it is clear that the concept of learning a skill or making an object for sale, along with the nature of the art activities as an enriched energy channel, was broadly accepted. At no point was the workshop seen as potentially subversive. At no point was the material censored or subject matter suggested, but the parameters of the teaching were clearly reassuring for the authorities. The project was not seen as disruptive in a potentially volatile environment and the outcomes were related to wellbeing, skills-building and market exchange. The approach Rory Prout took, which underpinned how he organised the team generally, was engagement in teacher/ student sessions set up as conventional classroom scenarios: the teacher demonstrated, the students learned. In the context of the painting tradition in Ethiopia, there is no canon of key artistic shifts; rather there is materiality – object, function, heritage, people, tribe, climate – which reflects African art more generally. However, painting with oils, drawing with pencils or erasing and re-painting are all tropes of Western education, so Rory’s painting teaching had a very Western character. The workshop was a well-ordered space, resembling a Western classroom with Western ideas around storage and preparation. There was a great sense of exploration in the formal transfer of knowledge from teacher to pupil, albeit with limitations and flaws of communication and understanding. However, what Rory and his team recognised was a growing confidence with the mastery of the rules, including perspective and drawing technique. This introduced a curiosity and focus that meant the next steps would have to move into intention and choice. Knowledge of indigenous interests and building local networks were therefore imperative. A move to engage the local technical college in seeing about accreditation or an introduction to art school in Addis Ababa for some proficient participants who would be released soon were mooted. What was clear, however, was that the outcomes of the painting classes had potential market currency: prisoners sold their paintings and participation in the classes held social currency within the prison society. A contrast in methodology was evident in the ceramics class led by Irish ceramicist Mary Conroy: instead of a teacher/ student scenario, a clear peer-to-peer training process emerged, where traditional methods used in Ethiopian ceramics were exchanged with Irish methods. What Conroy brought was an approach that included ceramics learning on both the part of the tutor and the students. It was a strand for women prisoners, who have fewer opportunities to engage in activities in the prison. The making of objects, especially kitchen utensils, is seen as women’s work and receives less recognition in society. This exchange of knowledge and methods drew on the activities of indigenous ceramicists in southern Ethiopia. Kiln management in the field, as well as the approach to decoration, was learnt through hiring a locally-based ceramicist. Conroy introduced notions of decoration and the traditional methods of the area were exchanged with her. The concept of drawing in advance proved very difficult for the Ethiopians, just as the very physical kneading of the clay was unusual for Conroy. This ceramics strand proved a very coherent learning exchange, with a naturally-integrated character and a promise of great deal of real skills-building. The prison authorities recognised that this might hold significant value for women prisoners. In conclusion, what is important to emphasise is that the intention of the artists was to impart knowledge. It became clear that when formal knowledge is transmitted, it is laden with layers of information and is complex to unpack. Knowledge that emerges out of the exchange between mutually curious and engaged parties has a greater chance of including the indigenous and the foreign, forming a hybrid. This requires a greater level of analysis and it would be good if the parameters of an experiment of longer duration and clearly outlined stages could be developed. The painting project could also benefit from further field work in order to lay foundations. This depends on the next stages, which are not yet clear or secured. The Arba Minch project has not ended and it remains to be seen what the next steps will be. Contact has been made with the art school in Addis Ababa and it is hoped that some painters might visit the prison class. Staff from a commercial gallery in Addis Ababa will also visit the prison. An exhibition that shows something of the methodology and experience, with an accompanying symposium, is in the planning stages. This project is indeed a work in progress, like many initiatives of this type in Africa. Arba Minch Art Project, 2016. Photography ©Isabella Walsh.